It’s officially “crunch time!” and as an employer, you are responsible for filing W-2 Forms and/or Form 1099-MISC by the end of the day! Like most employers, you’ll be taking advantage of some free time this weekend to take care of the various needs of your business. Instead of wasting countless hours at the computer filing your returns and mailing copies to recipients and employees on your own, utilize the easy-to-use services of TaxBandits! TaxBandits offers the most simplified and streamlined, interview-style e-filing process that helps to keep your business moving in the right direction. Allowing you to take your time back with fast tax filing, TaxBandits is the perfect filing solution for you! Both Form W-2 and 1099 can easily be filed with TaxBandits’ comprehensive software. All you have to do is complete your form is create a free TaxBandits account then follow our easy interview style e-filing guide. Our easy to follow instructions actually explain what information is required to complete your form and where it should be entered. If you file with TaxBandits, you won’t miss the deadline! 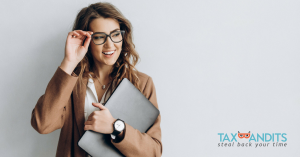 We provide all the employment wage tax returns you need online along with step-by-step e-filing instructions so you can instantly complete your 1099 and W-2 forms and transmit them directly to the IRS. E-file Form 941 in Minutes to Meet the First Quarter Deadline!